Sumax is known worldwide for their High Tech Manufacturing of Composite Fiberglass Motorcycle Fenders, Powdercoating Motorcycle, Automotive, and Industrial parts at ISO9000 specs.... and their Taylor Pro Spark Plug wires. 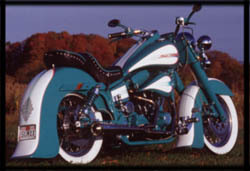 ENTER FENDERS CATALOG Composite Fiberglass - Sumax motorcycle fenders and air cleaner / coil covers can be found every month on custom motorcycles featured in magazines worldwide. Customers like the designs and the overall quality of the products. Rear fenders are rated at over 28,000 P.S.I. before they will break, That is 3 times the strength of steel at 1/3rd the cost! All products are finished in a flexible gray gelcoat primer. They are ready to scuff and shoot. 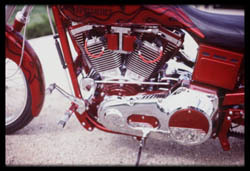 Special Effects Powdercoating - Sumax was the first company worldwide to offer powdercoating of motorcycle parts. Sumax set the standard by which all other powdercoaters are judged. A good finish begins with good preparation followed by proper masking, painting and final detailing. Special Effects are performed on Heads and Cylinders. Sumax offer's Definning, Hexing and Highlighting with powder paint in the background for a dramatic look as seen in the photo above. We also offer full show quality polishing on cases, heads, and cylinders. Taylor Pro Ignition Wires - Sumax designed Taylor made spark plugs wires have been the choice of Racers and Custom Bike builders for years. 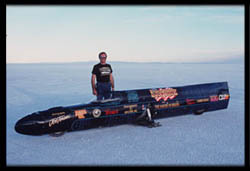 World records have been set for top speed at Bonneville, at Drag Strips and Race Tracks worldwide. Molded Drag Boots, 600 degree F. Heat Protection the Highest Voltage Capacity, Double Interlocking Plugs Connectors, Spiro Pro Core, Metallic Core, Resistor Core and 10 colors to choose from make these wires a winner!